Did you think of asking the author beforehand if he was okay with this? If you did, you didn't make that clear. If you didn't, you should have. PMd Guest Poster for ya. Keep cool while waiting for a response. Last edited by ksfanfic on Fri Jun 01, 2018 3:18 am, edited 1 time in total. Guest Poster wrote: LOL, didn't even know this. But I have no objections to it, so feel free to restore the link. It's back, ladies and gentlemen. Thank you for your patience. I also copy-pasted and edited a pdf version for myself, so that I can review from time to time while improving my English (I am not native speaker). This is truly a very enjoyable fanfic, and I learned a lot. Did you enjoy it too? What are your thoughts on it? 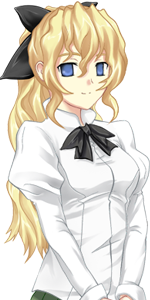 An interesting idea: Since in the fanfic Hanako wants to be writer, she can simply have Broken Quills write up her own story (including the original game and this fanfic), edited by Karla, translated to English by Lilly, and publish it with Karla's help. This will probably make her a good fortune. Seems like a good epilogue idea. Did you enjoy it too? What are your thoughts on it? I did! Sisterhood, along with Developments, are pretty much the most impressive fanfiction I've ever read. Can't wait for your comments. Remember to put spoiler tags. Developments huh, haven't read it yet. From the descriptions it seems the relationship involves two girls. Is it true? If so, I may have to pass, since I am a very faithful lover (I never cheat against Shizune, and I was almost a bit offended in Ch24 Sisterhood when the drunk boy peeked at Lilly). Please tell me so that I won't waste my time reading another 60 chapters. Developments huh, haven't read it yet. Please tell me so that I won't waste my time reading another 60 chapters. To this day, I don't know which of Sisterhood and Developments I like more, so if you liked the former, you definitely won't waste a second with the latter. Developments huh, haven't read it yet. From the descriptions it seems the relationship involves two girls. Is it true? Let's just say Hisao is a bit... indecisive in that one. Probably not in a way that would interfere with your enjoyment of the story, though. OK then, trust you. I will give it a try. The chapters are shorter though, so it should be faster to read. I always think that the boy is a bit of an idiot. Why would he attract so many girls in the first place!? On the other hand, this is a good lesson for me: Be more decisive in emotional matters. If you really love, go for it. Well, I'll be patient and read it all. Fingers crossed: Hope that our little indecisive protagonist finds his true love and makes a steady relationship . Still waiting for your comments though. That's definitely going to take a while and I don't want to use this throwaway account (only created it for the ebook) for actual discussion, so I'll either PM you or eventually post from my regular account. I "sort of" finished reading it. But yeah, let's keep the topic clear. One thing is: I still enjoyed Sisterhood way more though. I would have PM'd your regular account first, but since I don't know your regular account, I can't.